Russian Emergency Ministry employees lift a fragment of a plane outside Sochi, Russia. Rescue workers on Tuesday found a flight recorder from the Russian plane that crashed into the Black Sea over the weekend, the defense ministry said. All 84 passengers and eight crew members on the Russian military's Tu-154 plane are believed to have died. Russian Emergency Ministry employees lift a fragment of a plane outside Sochi, Russia. Rescue workers on Tuesday found a flight recorder from the Russian plane that crashed into the Black Sea over the weekend, the defense ministry said. 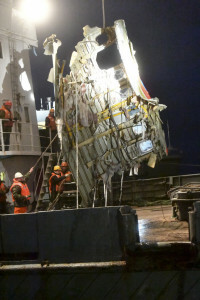 All 84 passengers and eight crew members on the Russian military’s Tu-154 plane are believed to have died.